On Sunday, I posted the image on the right (which you can click to make it bigger!) of a 5.25" and 3.5" floppy disk on Google+ to show some of the younger people I've met there how these now antiqued methods of data storage used to look like. It's not a very good photo and I took it just for fun, but I was amazed at the response - the young people found it interesting, but more amazingly the post triggered a lot of memories from older members of the photography community on Google+ who shared some of their encounters with floppy disks and older computers. Because of this unexpected response I decided to preserve this article here on the blog, but you can also still read the original Google+ post with the comments. Maybe I will also turn this into a regular series, since I have a lot more old computer stuff to show. The rest of this article is the original post I wrote. 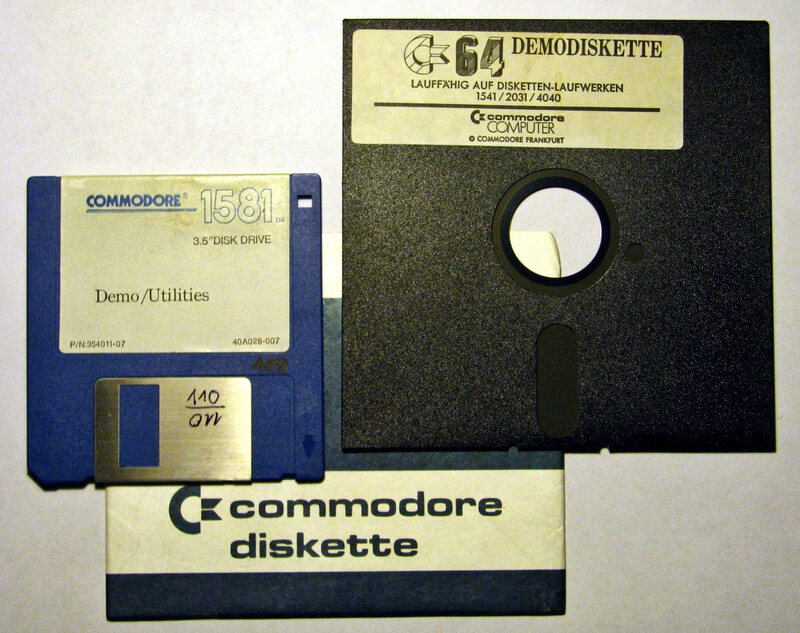 The big one on the right is a 5.25" disk from a Commodore 1541-II disk drive, my original one from early 1989. This is the reason they're called a Floppy Disk - they actually bend, because they're just a plastic disc with magnetic coating in a more or less protective sleeve. The storage capacity on the Commodore drives was 170 kilobytes on each side - to use the second side, you had to turn the disk around. There were some drives like the 1571 which had two heads and could read both sides simultaneously, doubling the capacity to a whopping 340 kilobytes. Just as a comparison: this image is about 400 kilobytes big and it would not even fit on a double-sided 5.25" disk! The 3.5" disk on the left is more sturdy, the inner magnetic disc is protected by a hard plastic case with a metal slider for read/write-head access. This disc came with a relatively rare 3.5" drive for the Commodore 64 and 128 I accidentially found in a local supermarket back then. The drive had an amazing capacity of about 800 kilobytes, this was almost like a harddrive for the Commodore 64. The downside was that you could not run any software on it which used so called Floppy Speeders, programs relying on the hardware of the 5.25" drives itself to speed up loading, but on the other hand it worked especially well with the graphical operating system GEOS, which was a kind of Windows for the old 8-bit-machines. Yes, those were the days... I can't say I miss them, because I've still got all the disks and computers, supplemented by some additional hardware from Ebay. All of my Commodore computers still work, even the drives and disks - which is especially amazing since they are around 25 years old now.